With Independence Day coming up this Friday in the USA, I felt like going a little patriotic this week with some red, white, and blue. Well, just white and blue for now, and we'll throw in some red accessories. 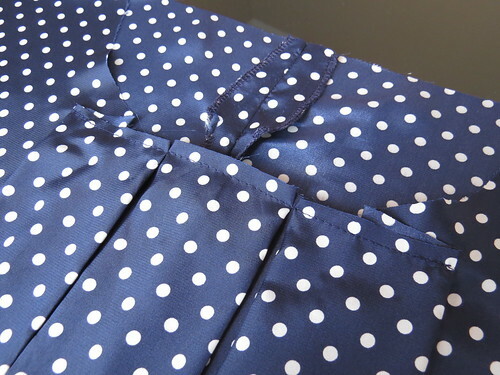 I grabbed this navy and white polka dotted skirt at the thrift store last month for $2 because, you know, polka dots. Although it may appear as those I am wearing a skirt that is too large for me, I am actually holding in front of myself a skirt that is too small for me. 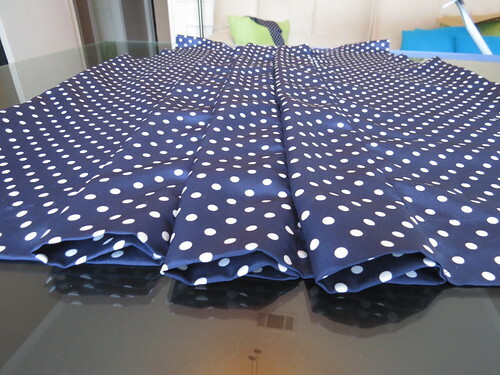 But with those pleats, I had no doubt there would be plenty of fabric to make something cute. 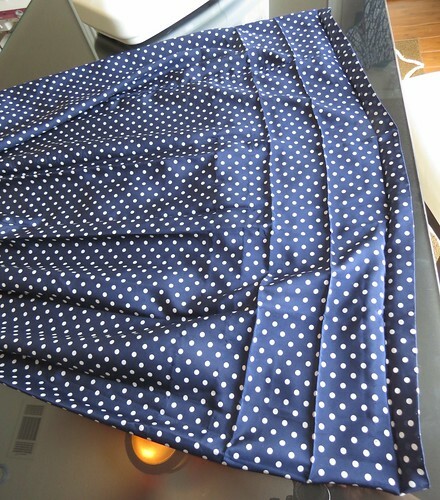 Upon closer inspection, I discovered a sizable hem, as if the previous owner had shortened the skirt at some point. 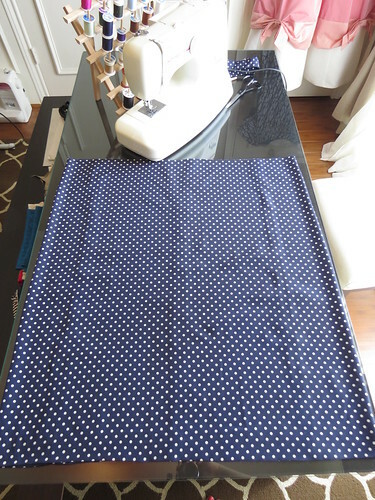 Picking out those stitches gained me another 7 inches of fabric! I left the original manufacturer's hem intact though. 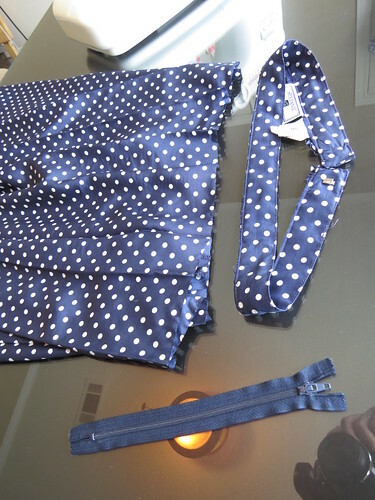 Then I carefully removed the zipper and snipped off the waistband. 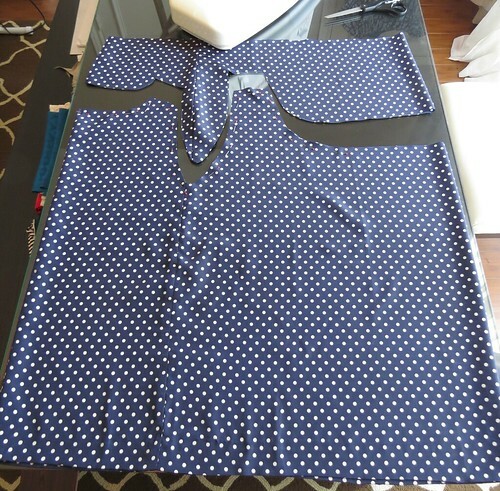 With the pleats and the super-sized hem pressed flat, I finally got a real sense of how much fabric I had. A lot. 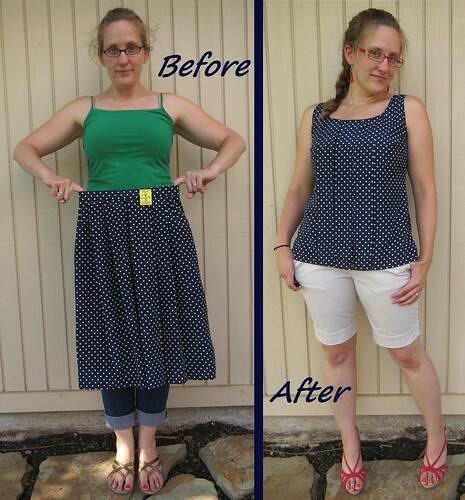 I folded the skirt-tube in half front-to-back (i.e., with the side seams held together) and pulled out my go-to tank top pattern. 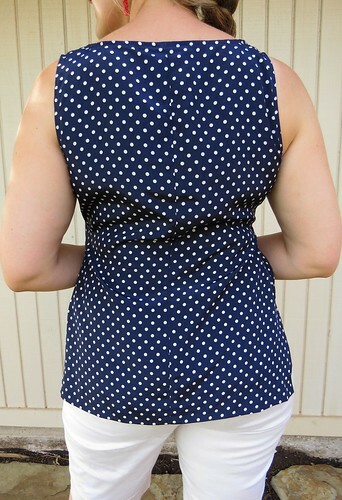 As luck would have it, the back of the skirt was exactly as wide as I needed for the back of my tank top. 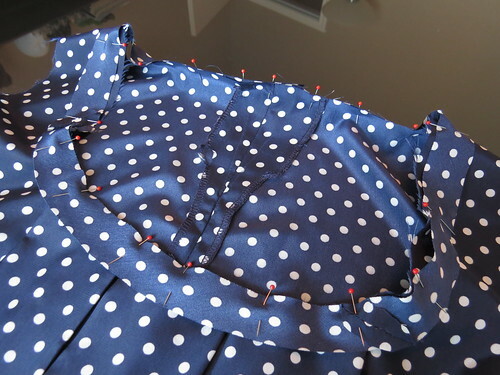 Since the fabric is pretty slick, I used pins to trace out my pattern. 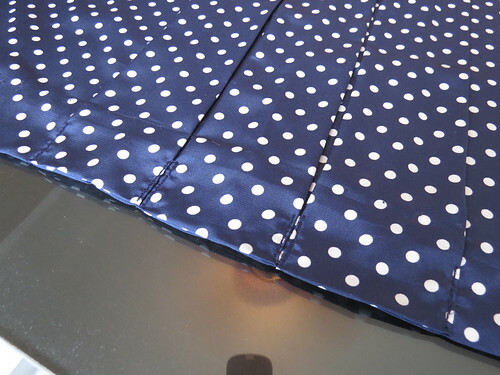 Then I cut straight across from the front neck edge to the fold in the fabric. 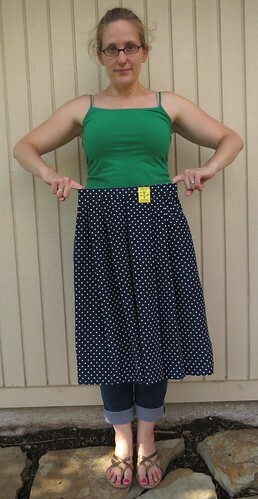 I plan to create some pleats on the front, a sort of homage to my tank top's former life as a pleated skirt. 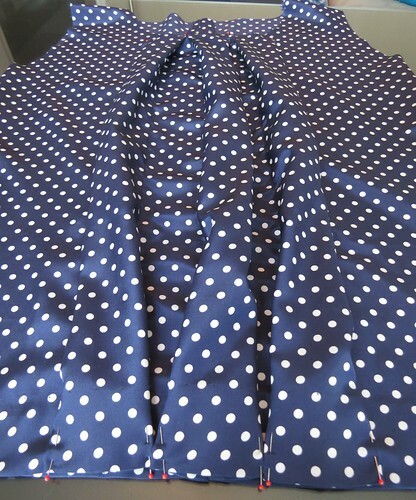 I sewed up the top of the center back, which used to be the bottom of the zipper. I stitched the shoulders together, right sides facing. 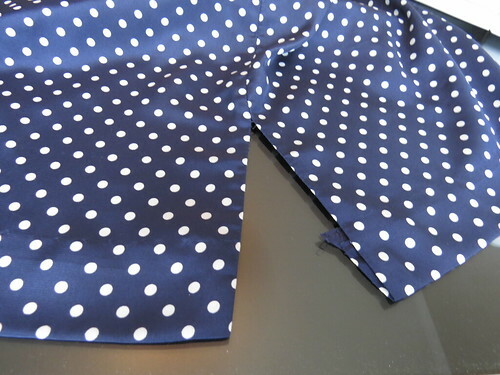 The seam allowances were folded under and the fold was stitched down to encase the raw edges. 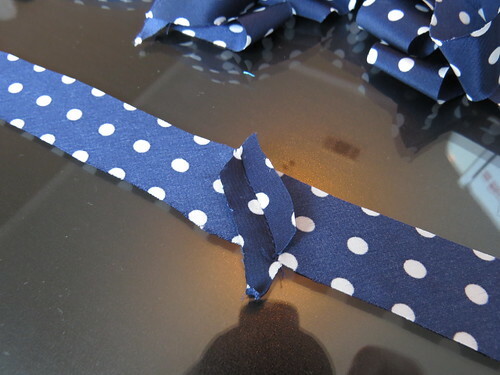 Then it was time to make those front pleats. 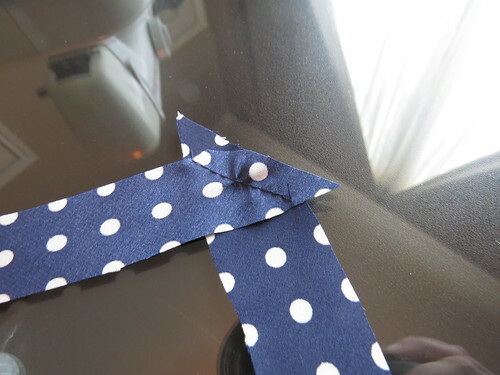 I folded along the center front line, wrong sides facing, and pinned 2.5 inches from the fold. Once that was sewn, I measured 5 inches from those stitches to one side, folded along that line, and pinned and sewed 2.5 inches from it. I repeated the process 5 inches to the other side of the center pleat as well. 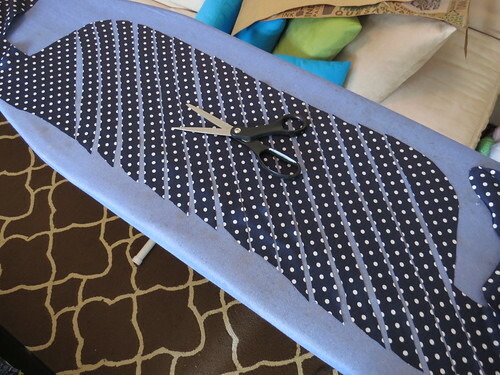 When I was finished, I had three flaps of fabric down the front of my shirt. 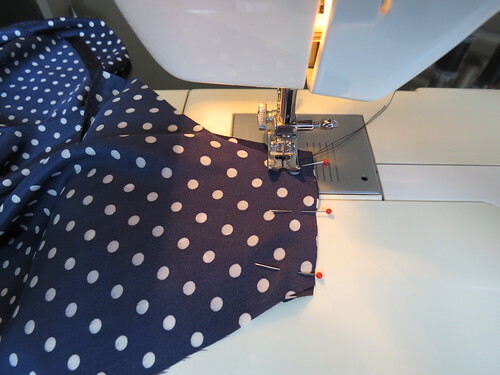 I open each flap and flattened them against the body, pinning the in place at the top and bottom edges. 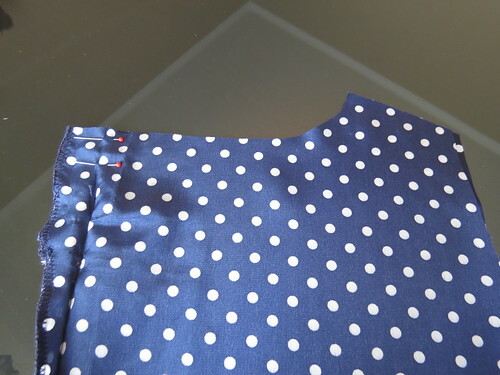 ... while the neck edge got a simple straight stitch across. 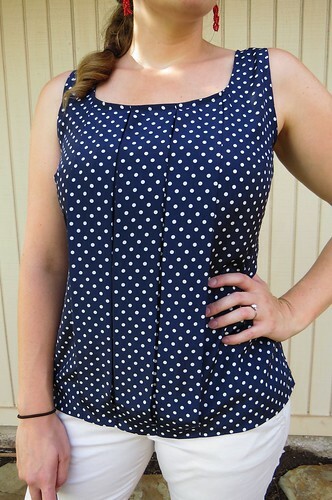 Now that the basic body of my top was complete, I was able to try it on and see what tweaks were necessary. 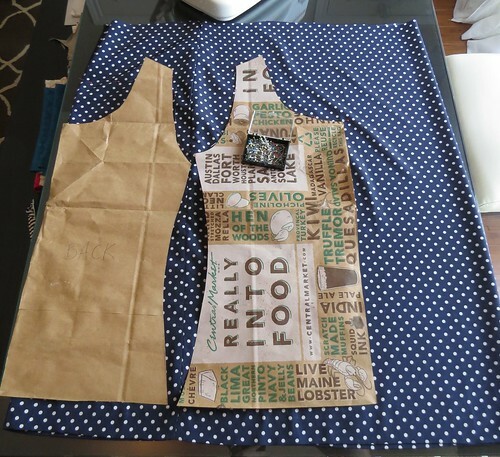 I lowered the neckline a bit and re-cut the scoop neck. 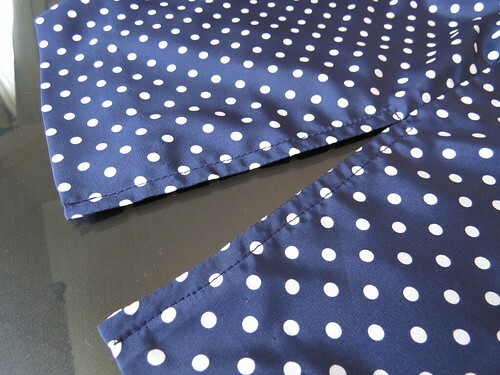 I also re-stitched the pleats in place. The bottom of the shirt was a bit too tight on my hips, so I decided to split the side seams and make it a little tunic-y. 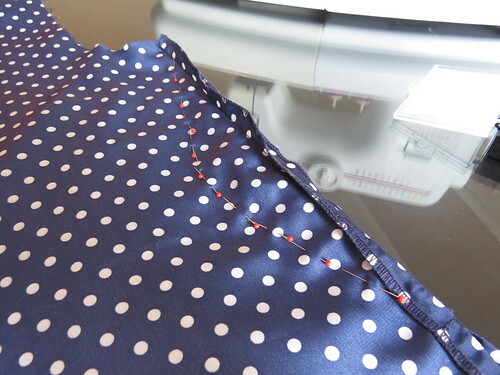 I used my seam ripper to open up about 6 inches of side seam from the bottom edge. 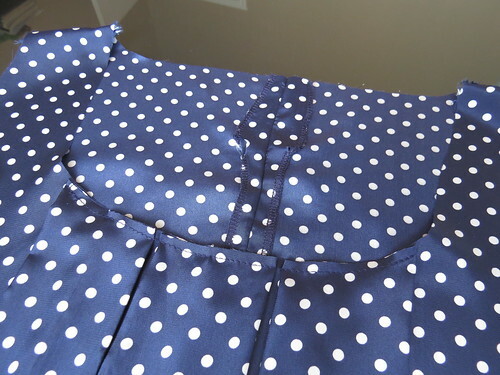 This would be more difficult if the seam allowances on the original skirt were serged together, but luckily, they were pressed outward and serged separately. 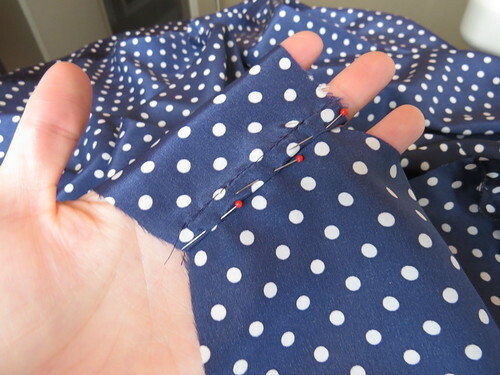 Then I top-stitched the edges to secure the serged seam allowances. Another tweak was to cut the armholes a bit bigger and add some bust darts. 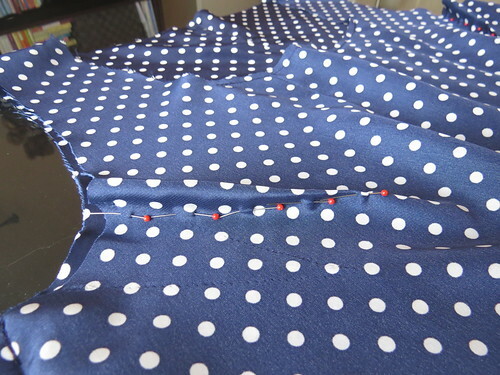 I also decided to take in the sides in a curve rather than leave the side seams straight. 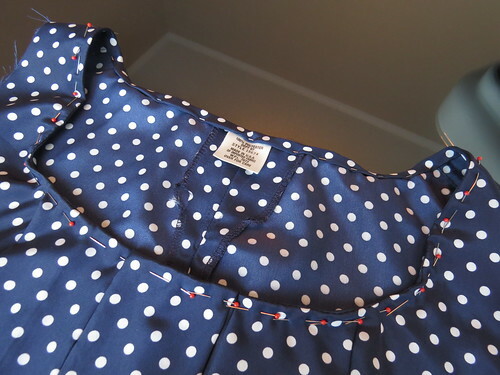 I thought I might have to re-use that salvaged zipper in one side seam, but fortunately, I was able to just barely get it over my chest. From the scraps, I cut what seemed like miles of bias stripes. 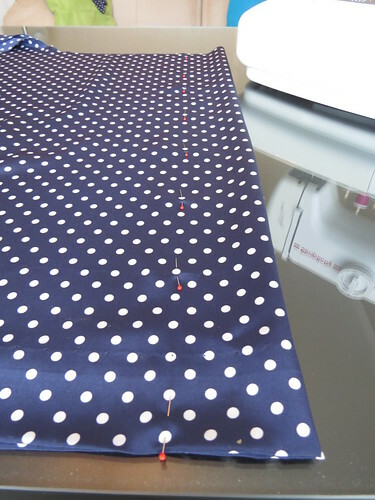 One good thing about an offset polka dot pattern is it makes for easy diagonal cutting. 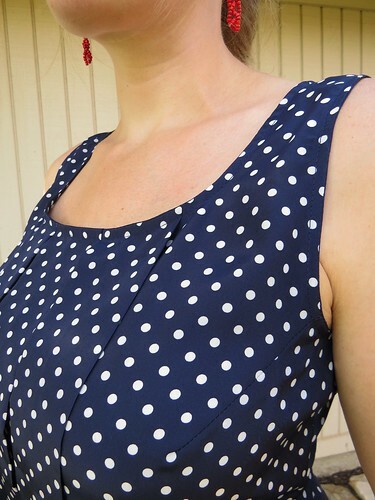 Next I pinned the bias strips to my neck edge, right sides together, and sewed it on. Then I got some good pics in the daylight today. For a little patriotic flair, I paired this with some red earrings, my red glasses, and a pair of red strappy wedges I picked up at Goodwill this weekend for $5. The shorts (also a $5 thrift find) are really a very pale khaki, though they look almost white in these pics. I'll be all set for the barbecuing this weekend! What a lot of work! But it was worth it. Oh yeah, definitely worth it! just MAGIC ! It's so amazing !!! Thanks! I really like the side vents too, even though they weren't part of the original plan.